In this article, I will walk you through the process of creating a scripted input in Splunk. With a scripted input, you configure your Splunk server or Universal Forwarder (UF) to run a script and capture the output of that script as events to be indexed by Splunk. This article will assume that you have some understanding of Splunk, running python and shell scripts on your system, and understand the difference between a Universal Forwarder and a Splunk Indexer. This article has been tested on Ubuntu 14, running Splunk 6.5. With minor modifications it should work for most Linux and Unix-based systems. We will assume that our initial goal is to have Splunk run a python script, capturing the output as events. We will configure Splunk to run this python script as a scripted input by creating a new add-on on the Splunk system. To do this, we will create our add-on folder in the apps directory of the Splunk system. The apps directory is located under the etc folder in the $SPLUNK_HOME directory. $SPLUNK_HOME is the location where Splunk was installed. On an indexer, this will often be /opt/splunk, while on a Universal Forwarder, this will often be /opt/splunkforwarder. This guide will assume that you are working on a Universal Forwarder, but all steps can be easily modified for a Splunk Indexer. When you install Splunk, a Splunk user is created. We want these folders to be owned by the Splunk user, to ensure that it can access these files. The first line tells Splunk that we are creating a scripted input. We reference the path to the file we want executed (note that we can not pass parameters to the script here, to do that you need a wrapper script, shown below). Rather than referencing the relative path to the script, you can also reference the full path of the script, relative to $SPLUNK_HOME. an example of this would be: [script://$SPLUNK_HOME/etc/apps/TA-SimpleApp/bin/TA-SimpleApp.py]. I prefer the relative path. If you want to reference a location outside of the $SPLUNK_HOME folder heirarchy, you need to use the .path option. The second line tells Splunk to run this script every 10 seconds. You can also set the script to run on a schedule. The third line is optional, and tells Splunk they sourcetype of the events (Why this matters). The fourth line tells Splunk to run this script. Set to True or 1 to prevent Splunk from running this script. The fifth line is optional, and tells Splunk which index events from this script should be written to. The index must exist on the Indexer, and the default index is main. strEvent = str(time.time()) + ", "
strEvent += "username=\"" + random.choice(["Stryker", "Valkerie", "Disco Stu"]) + "\", "
strEvent += "status=\"" + random.choice(["groovy", "hungry", "rage quit"]) + "\", "
strEvent += "admin=" + random.choice(["lenny", "carl", "moe"]) + ", "
Line 9 is an example of how we write information to the Splunk event log: $SPLUNK_HOME/var/log/splunk/splunkd.log. See the section below on logging. Line 12 is where we generate a single event for Splunk to consume. We start by printing the UNIX epoch time, followed by a comma-separated list of keys and values, ending with a newline (the print function ends each line with a newline). Epoch time is preferred because it is easy for Splunk to identify, and it is highly accurate. Splunk will automatically identify the key-value pairs in this instance. If your output is less structured, you would need to configure a props.conf and transforms.conf (a simple example of these files). Beginning with line 15, we loop thee times to create three random events. Each event will be written to stdout (using the print function at line 21, like above), and will terminate with a newline, which Splunk interprets as the end of the event. You can have Splunk ingest multiple-line events, by configuring Line Breaking in props.conf. Congratulations, if you have similar output to above, you now have a simple scripted input for Splunk. On a UF, you have to ensure that python is available. On an indexer, Splunk will use it’s own version of python (2.7.5), and on a UF, you’ll use the system’s version of python. You will notice that Splunk marks this event as an ERROR in the log, there doesn’t seem to be a way to modify this event to change the severity. On an indexer (rather than a UF), this command generates too much information (there are a number of apps that are started by Splunk on an Indexer, where on a UF there is only the one we created). On an indexer, you may want to grep for the name of the app: TA-SimpleApp instead. 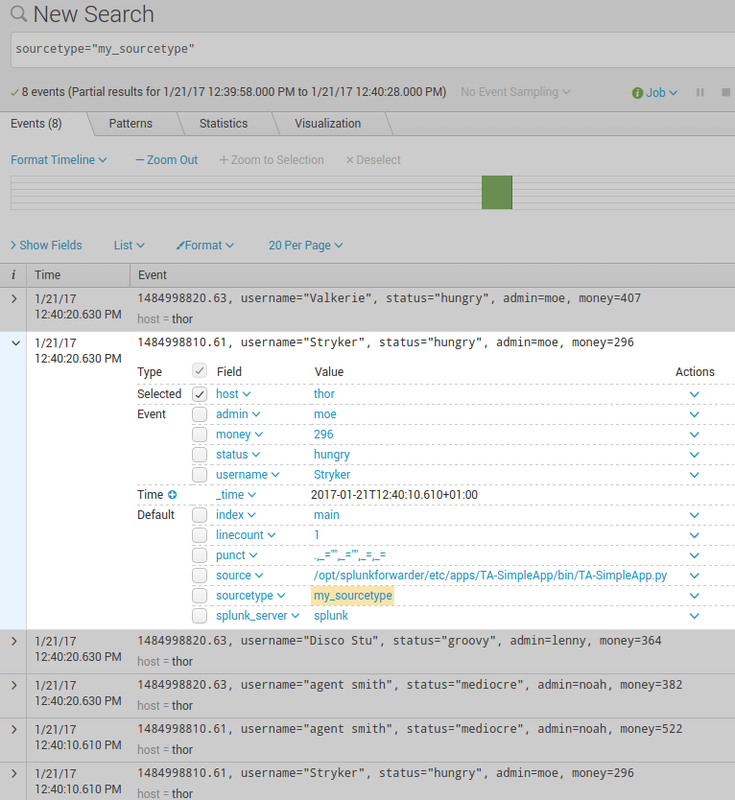 On line 4, we are writing to stderr, which adds the output to an event to the splunkd.log event log (this would probably be removed in a final release, but it is good for testing). On line 7 we are checking that we can find a python interpreter to run our script. If we can’t find one, we write an error to the splunkd.log log file and quit. on line 10 we are setting the current directory to the directory of this shell script. on line 11 we are calling our python script, which will execute and generate output just like the example above. This example is very similar to launching a python script directly, however we now have the ability to pass parameters, do additional setup, change environmental variables (if needed), test for a python interpreter, and other housekeeping. You could also call a binary executable, output to your own log files, and other required setup or testing for your script. Basically, if you can do it from a shell script, and it generates output to stdout and stderr, you can use it as a scripted input. For any scripts or applications you execute here (including all child applications), all data written to stdout will become an event on your Splunk indexer. All errors written to stderr will become entries in the splunkd.log log file. noah@thor:/opt/splunkforwarder/bin$ printenv | grep "splunk"
noah@thor:/opt/splunkforwarder/bin$ ./splunk cmd /usr/bin/printenv | grep "splunk"
If you want to see some examples of Splunk Tecnology Add-ons, just download them from the Splunkbase and browse through their files, or look at the links below. Feedback is welcomed, especially if there are errors in this guide or recommendations you have from your own experience. Please contact me here. Building Splunk Technology Add-ons From the Splunk blog.